Android is Google’s operating system for cellphones. Online reviews paint the OS as a much needed break from the alternatives available. You might have read these reviews and concluded that Android is surely a wonderful mobile OS. I thought so too… until recently. Twitter has finally released its official application for Android. The application is compatible with Android version 2.1. Unfortunately only a small portion (27%, to be more precise) of Android users are running version 2.1. The reason for this is fragmentation issues. To clarify things a bit: Android is a free mobile operating system. That means that unlike the iPhone OS, cellphone companies can modify Android’s code for their handsets. This is exactly what happens. Not only are cellphone companies releasing phones with older versions of Android but they are also releasing them with custom versions of Android. In some instances they are excluding important libraries of Android code. The result is each company going off in its own direction, with no singular standard established. The latest version of Android is being run by only a small percentage of users which makes application compatibility very difficult and the job of an Android application developer even more difficult. 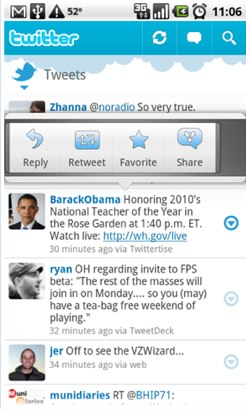 Twitter cannot be expected to create applications for versions of Android other than the latest. Any moves to remedy this issue need to be made by Google. Let us all hope that Google takes some quick action. First of all, people should boycott phones if they know the cell phone company has modified the OS. My question is…….can you ‘upgrade’ the OS if you buy a Droid from Verizon…..for instance ? How about a Nexus One ? Shouldn’t Android make ‘self updates’ a priority ?